Stephen Greenblatt, whose latest book is “The Rise and Fall of Adam and Eve,” winner of the 2012 Pulitzer Prize in non-fiction for “The Swerve,” in conversation with Richard Wolinsky. The story of Adam and Eve in the Garden of Eden, though only a couple of pages in length, ha proven to be one of the most durable and consequential myths in the history of civilization. Notions such as original sin and the lowered status of women derive (via interpretation) from this awkward and problematic story. 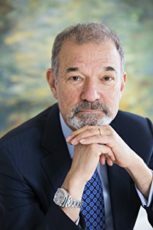 In this wide-ranging interview, Stephen Greenblatt traces the myth and how it has affected society through examination of Saint Augustine (who created the notion of original sin) to Saint Jerome, and as enlightenment weakened the story’s influence, through the poet Milton and modern ideas about cloning and in vitro fertilization.